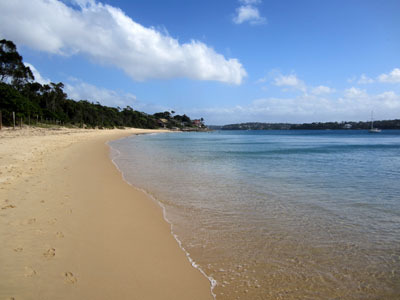 Shhh, this is one of Sydney's Best Kept Secrets. I thought you had to travel thousands of kms to Northern Territory or central Australia to explore and experience our indigenous heritage. Jibbon is within arm's reach right here in your home town, Sydney. 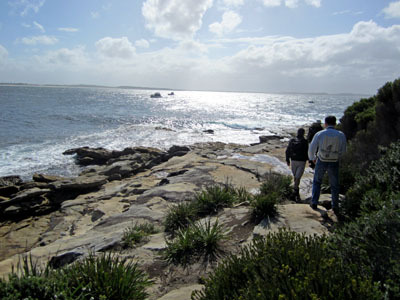 Step on ancient sacred grounds and learn about a time of 'Dreaming' on this magical walking tour to Jibbon which sits on the shores of the Royal National Park just one and a half hours south from Sydney's CBD. This day enriched my life in many ways, changing my perspective on how we live, gaining a deeper respect for the land we live upon in addition to discovering a culture profoundly connected with all elements of life. I shook my head in disbelief, and slightly embarrassed, may I add, this magnificent park and history was literally at my doorstep and never took the time until today. 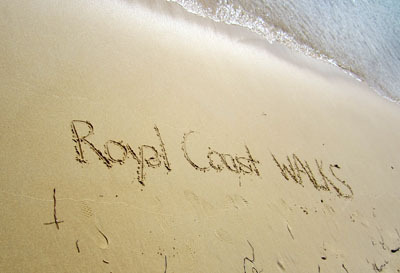 The ½ day tour begins at 8.15am on the public wharf in Cronulla where we met with Ian, our guide and owner, of Royal Coast Walks. Handing each a canvas 'goodies bag', containing a 'nibbles' packet of raw nuts and dried fruit, a map of the Royal National Park and brochures. The bag could be used as a backpack in case we didn't bring one. Hands up who didn't bring one. Yep, me! 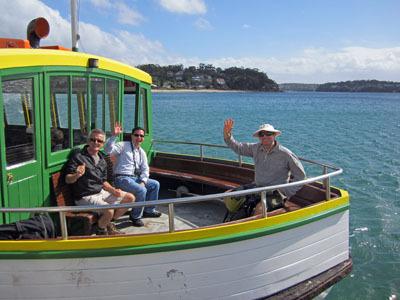 Boarding the small 73 year old timber passenger ferry Curranulla, Ian's passion and knowledge for the region became evident. Reciting the ferry's name by Indigenous Australians for 'pink sea shells', hence the European version became Cronulla. 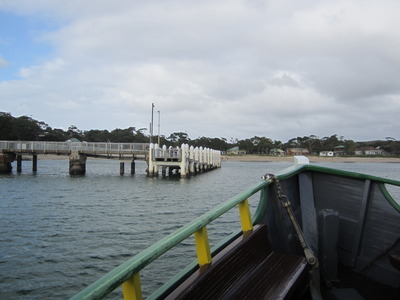 Cruising across the bay, Ian directed our vision to headlands, peninsulas and sand spits detailing their indigenous names and meanings. So mesmerised about what I was 'seeing' and learning, my head rotating side to side, mouth open, I felt like one of those clowns in the arcade, where you drop a ping pong ball into their mouth. 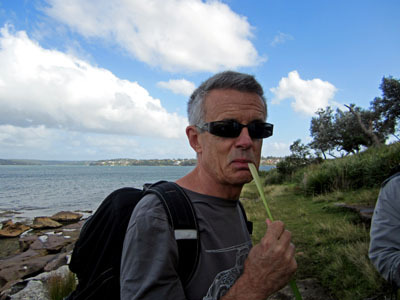 Twenty five minutes later, mouth now closed and a little dry, I swigged some water (which was in my newly acquired and convenient backpack) as we pulled into Bundeena wharf, a charming village nestled on The Royal National Park's rim. We were standing in the heart of the region where the indigenous Dharawal people lived for thousands of years. 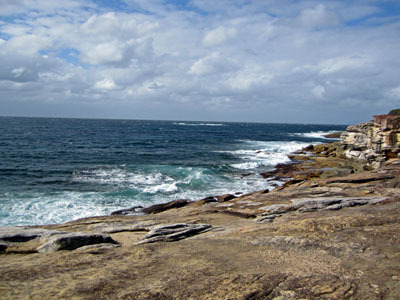 The Royal National Park is the world's second oldest purposed national park (after Yellowstone in the U.S.A.) Proclaimed in 1879 and in 2006 was added to the Australian National Heritage List. A quick 'loo' stop and our three hour excursion began, a mere 10 minute walk behind the town centre, to picturesque Jibbon Beach. 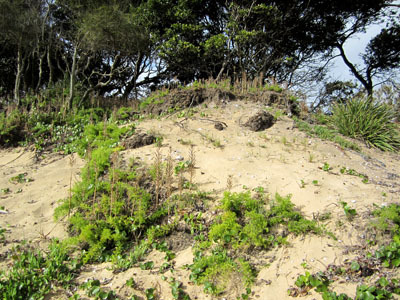 The shrubs behind the sand are fenced to protect the 7,000 year old, 200 meter long, 10 meter deep 'midden'. A 'midden' is a place where Indigenous Australians placed their refuge of oyster and other sea shells, fish skeletons or animal bones. So in tuned with nature and preserving their natural food supplies, an unspoken natural law is when a person from another tribe walked into their site and saw, say, oyster shells had been recently consumed and discarded on top of the 'midden', they searched for other sea crustaceans to collect and eat, thus allowing the oysters in the area time to replenish themselves. This was the point where I began to gain a deep respect for the Indigenous Australian's culture and became eager to learn more. Sampling some 'bush tucker' of Lomandra leaves. Edible,but won't be finding this on my midnight snack list. We began walking inland through the bush on an easy dirt track. 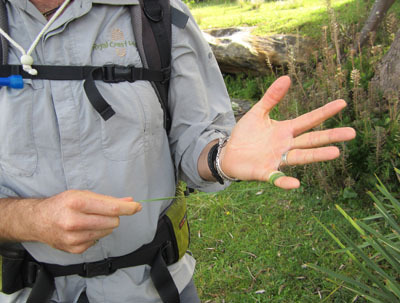 Along the way we sampled some 'bush tucker' of Lomandra leaves. 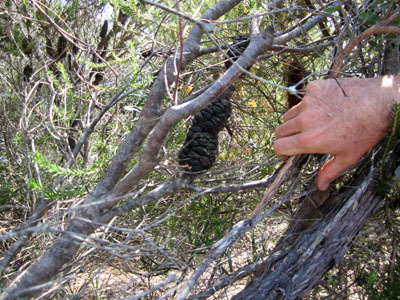 (I was a little fearful we were going to sample some grubs or something else that crawled.) Not bad, chewing and sucking on the base gives a starchy taste, although they won't be finding my midnight snack list. Demonstrations of the uses of plants. Shown how they transported fire embers and plants that produced their sugars. Heated in their fires. then wrapped in leaves to transport the embers for the following nights fire. A bit like a hot Esky. 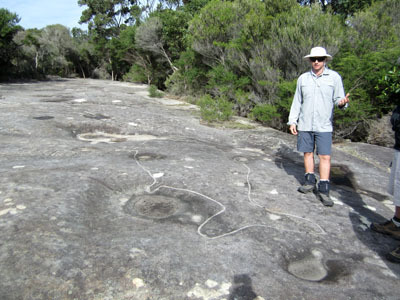 Continuing on, we enter a site originally regarded as 'secret men's business' only, where the Dharawal men carved mammals into the rock 1,000 years before. The carving of the Orca whale is several meters long and easily visible. We learned about 'Dreaming'. 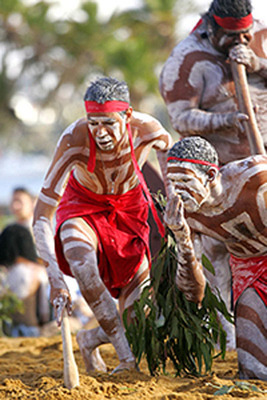 Indigenous Australians used this term to describe their beliefs or spirituality in its entirety. As there was no written language, all information was passed down with 'Dreaming Stories' covering all creation, sacred places, land, people, animals and plants, law and custom, before and after life. They are spoken, sung and with dance. It was explained so beautifully and listened to some amazing 'Dreaming' stories. This part of the tour is a must to hear as Ian's knowledge has been collected over many years through his own research and close associations with descendants of the Dharawal people, information you would not be able to Google or look up in any library. Moving on, it was time to enjoy some spectacular coastal rock scenery of brilliant coloured sandstone and rock pools as we headed towards Shelley Beach and looped back towards Bundeena in time for the ferry to take us back to Cronulla wharf arriving around 1pm. I can write this for you to read the words; however when you stand on these grounds and listen to the ancient stories you gain another dimension to life and times when these lands were honoured with dignity and respect for around 30,000 years our native inhabitants roamed this country in harmony. Oh, I could not resist leaving my own 'carvings' in the sand. Somehow I don't think they will be there next time I return. This was not just a walk; it is history, an interpretation and appreciation of the area, engaging with the environment. Covering just 5kms of 154 km2 the Royal National Park totals, I am eagerly planning my next walking experience. Note: This is a fantastic experience for your overseas visitors who are on a short stay. Go by yourself, with a friend or take your children. I guarantee you will return with a different perspective on life. I learned more in the 1/2 hour tour about our indigenous history than all my years at school. 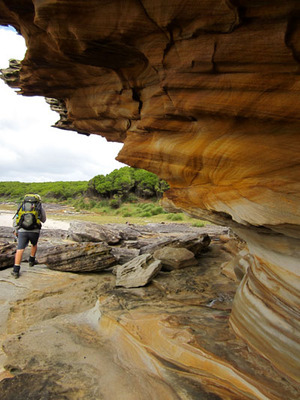 ½ Day Jibbon Aboriginal Tour: A very easy paced 5km walk with a 20 meter gradual elevation. 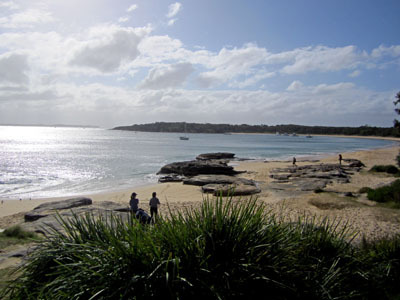 Begins: 8.15am @ Public Wharf, Tonkin Street, Cronulla - a short stroll behind the train station. Parking available: Signage quite visible. Walking time: Three hours - with plenty of time to stop and take photos, look at the fauna, while feeling engaged at every point. Fitness: Recommended reasonable level of fitness and children over the age of 8years. Why? Shhh, this is one of Sydney's Best Kept Secrets.